Years ago God laid on my heart the necessity of being a submissive wife. He guided me towards Proverbs 31:10-30 and opened my eyes, and heart, so that I could understand what He was really saying. After several months of struggling I gave my pride to God and accepted my new role. It wasn’t long before I began to see and feel the rightness of what God had laid out. I admit that I’m am far from being June Cleaver, in fact I’m probably more comparable to Peg Bundy with smaller hair. One essential tool in my box, though, is my crockpot. Even on my busiest of days I can spend fifteen minutes throwing things together and have a warm, yummy meal for dinner (with minimal clean-up I might add)! Being a submissive wife doesn’t mean that you have to be a perfect homemaker with lace doilies and fine china. It means that like an employee to a supervisor, you acknowledge and accept the chain of command that God has set and you trust in Him. Submission is not synonymous with weakness but rather the opposite. Don’t believe me? The next time someone ticks you off, walk away without so much as giving them a dirty look. Then, the next time you see them retain no bitterness and treat them as if they were your best friend. Do all of that with a smile and tell me how easy it was! 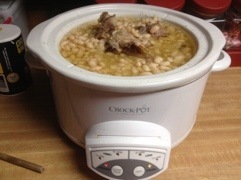 So, tell me, what is your favorite crockpot meal? What tricks and tips do you have for meeting your families needs? Tell her Mel sent you. She has no idea who I am but it sure does make me feel important to say that!